Premier League teams remain unbeaten after contesting 15 games in the Champions League group stage but that status may change after Roma have taken on Chelsea in the Eternal City. Chelsea are in an excellent position in Group C with seven points from three games and may be boosted by the return of key midfielder N'Golo Kante, who is back in training after three weeks out with a hamstring strain. Four points from the remaining three games would guarantee them a last-16 place and the Blues would expect to collect three of those when travelling to Qarabag on matchday five, although Chelsea's fans could be left freaking out after this tricky Halloween trip. 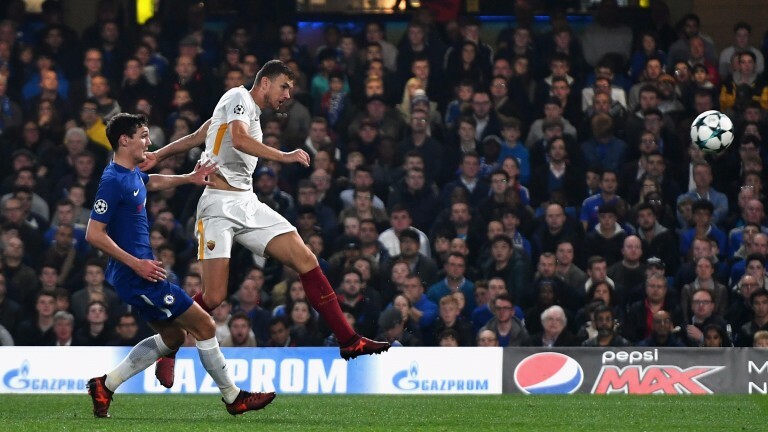 Avoiding defeat at the Stadio Olimpico will be their priority but Chelsea need to be much tighter at the back than they were when drawing 3-3 in a thriller at home to Roma two weeks ago. Without playing particularly well Antonio Conte's side opened up a two-goal lead but they collapsed either side of half-time and were staring at a deserved defeat until Eden Hazard levelled things up with his second goal of the game. Chelsea played like the away side for much of the night with only 40 per cent possession and needed their brilliant Belgian to get them out of trouble. Hazard was also the match-winner in a more convincing 1-0 success at Bournemouth on Saturday. Chelsea's performance on the south coast - where they bossed the shot count 18-7 - was their most convincing since losing Kante to injury during the last international break. It was their first clean sheet in seven matches and a more controlled performance than had been the case in recent weeks. However, the Blues were helped by questionable tactics from their opponents. Bournemouth boss Eddie Howe went with two up front but his team were outnumbered in midfield and not at the races until a half-time change which saw Defoe make way for winger Jordon Ibe. Roma will not be as tactically naive as the Cherries and their powerful midfield - featuring one-time Chelsea target Radja Nainggolan - is likely to have the edge, despite being challenged more by a Blues side with Kante likely restored to the engine room. Roma backed up the point they achieved at Chelsea with three successive 1-0 wins away to Torino and at home to Crotone and Bologna. They are fifth in Serie A, seven points behind leaders Napoli with a game in hand, and their defensive problems at Stamford Bridge were out of character. The Wolves had the second-best defensive record in Serie A last term and have the meanest defence this season, shipping just five goals in ten league matches. They were without accomplished centre-back Kostas Manolas for the match at Stamford Bridge but the Greek international is back in training and likely to replace either Federico Fazio or Juan Jesus, who paired up for Saturday's success over Bologna. Nainggolan was rested for the Bologna game and fellow first-team regulars Aleksandr Kolarov and Diego Perotti were also taking out of the starting line-up as coach Eusebio Di Francesco had one eye on this crucial clash. Di Francesco's team should be close to full-strength and as well prepared as possible to put in a big performance. The markets are struggling to separate the teams but Roma look the likelier winners and are value to get the three points they need to hit the Group C summit. Gregoire Defrel isdoubtful, while Bruno Peres and Rick Karsdorp are sidelined. Kostas Manolas returns to the squad after two weeks out. Victor Moses is out but N'Golo Kante is back in training and could come straight back into the starting line-up. Roma have won eight of their last ten matches.